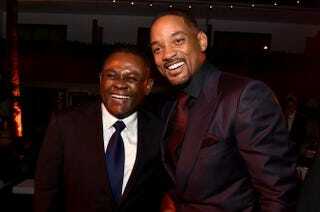 Dr. Bennet Omalu and actor Will Smith attend the after-party for a gala premiere of Concussion during the AFI Fest on Nov. 10, 2015, in Hollywood, Calif. Unfortunately, O.J. Simpson would have to die in order to test this hypothesis: Dr. Bennet Omalu—the Nigerian doctor who inspired the movie Concussion by discovering chronic traumatic encephalopathy, or CTE, a debilitating brain disease sometimes found in football players—suspects that the NFL Hall of Famer has CTE. "I would bet my medical license that he has CTE," Omalu told People magazine. Omalu said that "given [O.J's] profile […] I think it's not an irresponsible conclusion to suspect he has CTE." That profile includes being accused of murdering his ex-wife Nicole Brown Simpson (Simpson was acquitted on those charges in 1995) and, more recently, an offense that landed him in prison: He was found guilty in 2008 of kidnapping, assault and robbery after an incident in a Las Vegas hotel room involving his sports memorabilia. Omalu's research found that CTE comes about as a result of repeated blows to the head, the kind sometimes sustained by football players. People with CTE exhibit symptoms like "mood swings, unjustified violent tendencies, domestic violence, criminality and exaggerated emotional reactions to everyday stresses," People explains. The magazine also reports that during the 2008 trial, Simpson considered using the defense that the concussions he sustained while playing football influenced his behavior.